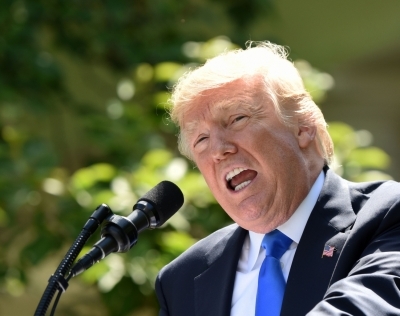 Washington, July 30 (IANS) US President Donald Trump has warned of slashing subsidies provided to people enabling them to buy health insurance if Republican lawmakers cannot quickly approve a legislation to replace Obamacare. “If a new HealthCare Bill is not approved quickly, BAILOUTS for Insurance Companies and BAILOUTS for Members of Congress will end very soon!” Trump warned on Twitter on Saturday. Senators on Friday rejected a bill partially replacing the health care reform implemented in 2010 by former President Barack Obama. Senator John McCain, recently diagnosed with brain cancer, was one of three Republican senators to vote against the bill, along with all the Senate Democrats, thus ensuring its defeat. The subsidies to insurance companies that Trump threatened to end have ensured that deductibles, copayments and other costs to low-income people have been lower than they otherwise would have been under Obamacare. Meanwhile, Senate Minority Leader Chuck Schumer on Saturday immediately rejected the President’s message and said Trump “ought to stop playing politics with people’s lives & #health care, start leading and finally begin acting presidential”. Many observers noted that, with the failure of the Senate bill on Friday, it was – at least for now – virtually the last change for Republicans to overturn and replace, albeit in diluted form, Obama’s signature piece of legislation, even though they have obsessed over it and promised to do so for the past seven years. However, neither Trump nor some Republican senators appear to be ready to throw in the towel. “Unless the Republican Senators are total quitters, Repeal and Replace is not dead! Demand another vote before voting on any other bill!” Trump urged in another Saturday tweet. However, Republican congressional leaders appeared to be ready to turn the page and begin negotiating with Democrats to modify the current law.